Just before Christmas Easy-Jet were offering some pretty good deals to fly to some of the major European Cities, one of them, Paris was only £25 return! An offer I couldn’t turn down. Before I knew it I had booked the tickets and all that was left was to find a hotel, how hard can it be to find a cheap, nice hotel near the attractions. . . . .apparently very hard as I found out. With a Budget of £90 a night I started to look for hotels within walking distance or a subway ride of the major attractions. One of the areas that I found was Monmartre, it had a great choice of hotels and restaurants within walking distance of the main sights. 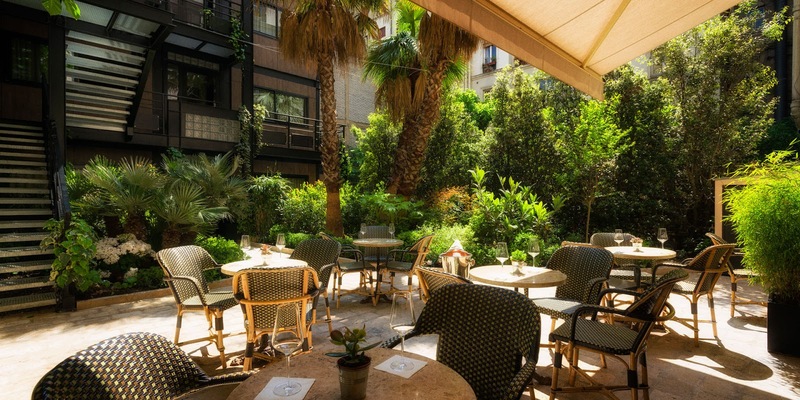 Cue the B Monmartre, a nice boutique hotel which even has a little tropical garden with palm trees rising into the sky out the back. The hotel rooms are small but modern and clean with all that you require after a long day out exploring the city. Once we had checked in and freshened up we decided to explore the local area, I took Jess on a mystery tour to a place that apparently gave the best sunset view of the city. Twenty minutes of walking later I was beginning to wonder if this place actually existed as we wandered through a random cemertery. Thankfully after a short walk up a hill we ended up in the market square of Place du Tertre and things started to look up! And then right on cue when we walked around the corner, flanked by a huge cathedral, was an incredible view of the city with the sun setting beside the Eiffel Tower. The night was finished with some drinks in the Bistrot Du 9eme during their happy hour (5 Euro cocktails) and a walk back to the hotel via the Moulin Rouge. Our second day started early-ish - we grabbed some breakfast from a great local bakery before taking a walk down to the Galeries Lafayette. The centre foyer in here is incredible, it's just about the most impressive department store ever!! Just look at that roof! Sick of bumping into the countless people staring at the roof we decided it was time to head off on a walk to the Louvre. I used an app called “SatNav” keep us right doing the trip, its free to download and you get one free offline country (extras are £3). I definitely recommend it as it kept us from getting lost and won't cost you anything on data. A good forty-five minutes later we arrived at the Louvre. There was a short queue (extra security at all monuments at the moment) but once we were in we took some time to admire the famous glass domes from the entrance gallery. The Louvre itself is a huge museum and probably best not to just rush round it so we decided to keep it for another time. We did however spend some time in the vast underground labyrinth that stretches for miles and miles under the museum. If you do want to go in it's free for any students and EU national under 25 , free for anyone under 25 on a Friday night or €17 for a normal ticket. Refuelled with a quick coffee and bite to eat we made our way back along the river taking in the sights before eventually ending up at the main attraction. The Eiffel Tower, of course. We gave the tower a good looking at before deciding that it was too much effort to go up. Plus the view from the ground was pretty good anyways. Satisfied with our photo haul we began the freezing cold, hour long trek back to the hotel through the residential side of Paris. We even stumbled upon a nice little restaurant that served up some great French food and drink on the way. Having clocked up a good 26 miles by this point, our feet were getting a bit sore. The executive decision was made (by Jess) to get the all-day €10 subway ticket. 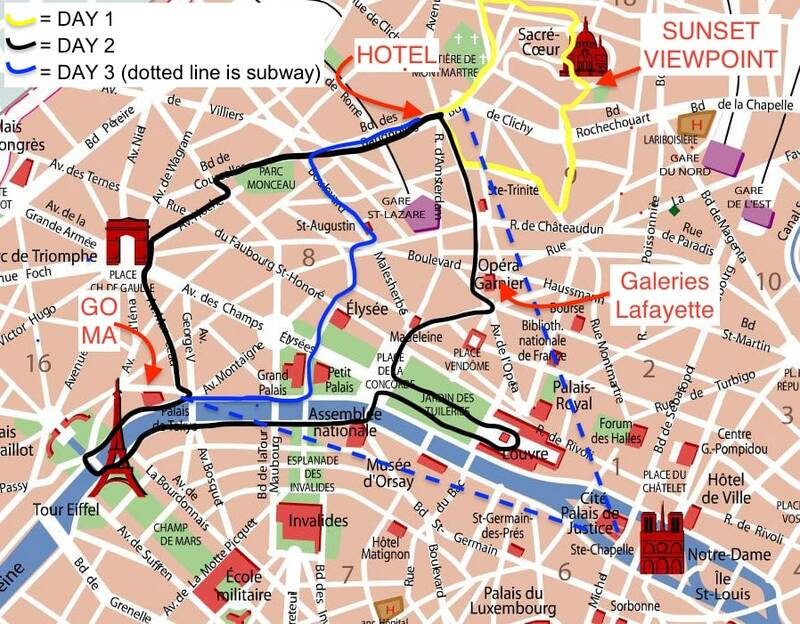 This gave us access to all the stops within the centre of Paris. We quickly ended up at the Notre Dame which we actually did go into, 10 tourist points to us! The building is quite incredible and since its free to get in to we couldn’t turn it down (#cheapskates). Next up a subway ride to the GOMA (free entry) where we spent 45mins being confused by some very weird exhibits. Deciding that maybe we just didn’t get art it was time to do something that we really do get. Drinking. The rest of the afternoon was spent trying out some local bars and famous Macron shops where we ate and drank our self until we ended up crashed out in bed. 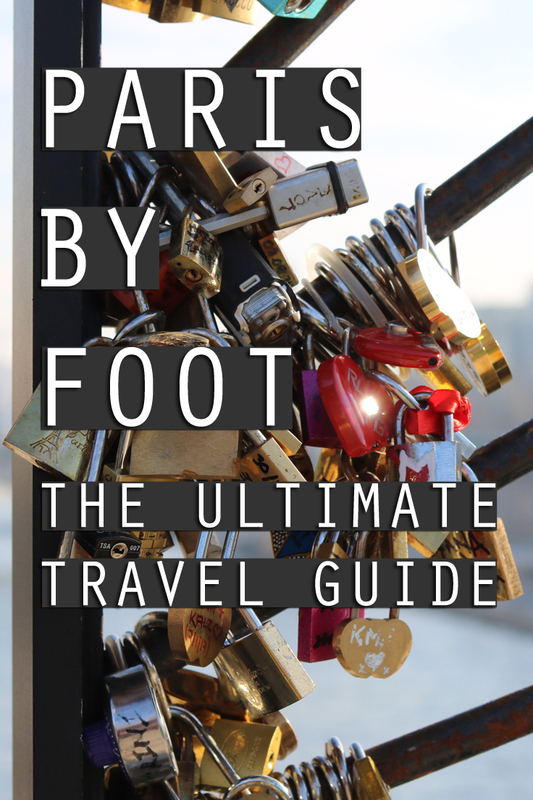 Would I recommend Paris in the depth of Winter? Damn right! If you wrap up warm and can brave the cold -2C days then you can see Paris without the mad crowds and you can save yourself a fortune on hotels. If you fancy cramming in a good old 36 mile hike around the city then check out this super awesome map I made. Why not sign up to the mailing list and be the first to hear about all my travels :).